Referred to by some as the Mini-Nürburgring, Cadwell Park features challenging elevation and camber variations as well as high speeds, often resulting in faster vehicles detaching from the Earth entirely. The layout is short and scarily narrow throughout, resulting in limiting passing opportunities, especially for larger vehicles. Turn 1 is a fast uphill left-hander that allows for extra entry speed. Leave some room on the right for the entry into Turn 2, the first of the Charlies. Motorcycles will stick to the inside of the second Charlie, while four-wheeled vehicles take an earlier apex. Following the large Park Straight is the Park/Chris Curve combo. Apex slightly early at Park, and hit the first apex at Chris Curve. Winding out of Chris Curve, vehicles without downforce should let the throttle carry them close to the left-hand side of the track before pulling back in for the Gooseneck. Once through Turn 8, the downhill section continues with Turns 9 and 10, aka into the Mountain. The choice in Turn 9 is mainly how close to hug the inside before turning into 10. 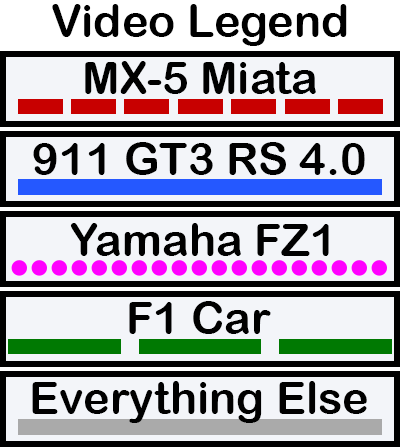 The lines are the same for most vehicles except those with particularly high cornering force and power, which will set up for Turn 10 farthest to the left. The Hall Bends are a challenging sequences of turns that require a lot of experience to get right. Approaching Turn 15, don\'t go farther left than you need to get a smooth radius through the turn. Most vehicles will take only the first apex at Barn, whereas fast bikes will take the double apex, which leads us back through the start/finish line for another lap! Nice driving. This vehicle seems to have a similar power level as a Miata (I think the speedo is in km/h) so I'm classifying it that way. Fahad is clearly a very talented driver. Now all he needs is a mirror that stays in place! On the last lap I noticed he was hugging the inside of Turn 5 rather than letting the line drift out toward mid-track, which is preferred. This driver relies a little much on throttle steer, particularly at corners 15 and 16. This is a good video to the learn the lines and braking points in a vehicle with medium power. The laps are pretty quick also, with the best ones landing in between ideal times for a Miata and a GT3 RS. This lap is truly enjoyable to watch, as Matt flies through Cadwell Park at breakneck speed. His line selection is almost a perfect match to the Al's F1 line, despite the significant changes in elevation and camber throughout the course. A good chase early in the video. Very nice laps, too.